Dress looks baggy. Material is printed with dots and the middle of back is not carefully matched. Would benefit from about 2 inches more of length and then a belt would not pull it up so much. I am 5'4", 125lbs I ordered the extra small and the small to see which would fit. Unfortunately, the crepe material is not my style at all I found out, and the sleeves were too long, the dress was down to my knees, and the middle both dresses was large. It resembled a sack dress in crepe material, thus may do well for a particular style woman. Pretty color however, the L was too small in the arm and chest area. Returned. 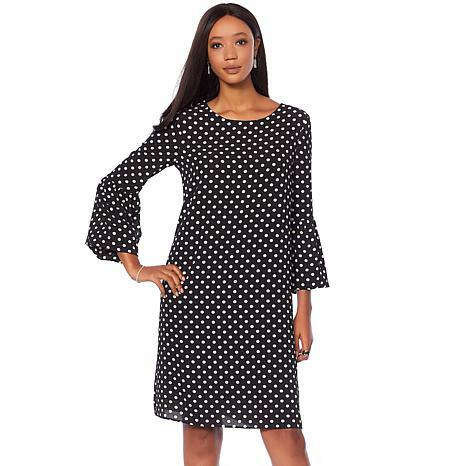 I loved the print, and it fit perfectly, but it was matronly on me.